Ten University of Notre Dame students have been awarded Fulbright grants in the 2014-15 program, placing the University among the top-producing universities in the nation. 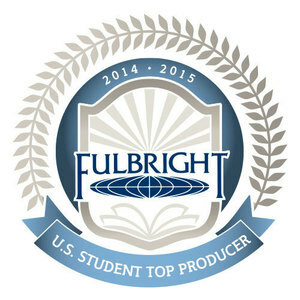 The U.S. government’s flagship international educational exchange program, Fulbright recently announced the complete list of colleges and universities that produced the most 2014-15 U.S. Fulbright students. The success of the top-producing institutions is highlighted in Thursday’s edition (Feb. 12) of The Chronicle of Higher Education. Since its inception in 1946, the Fulbright Program has provided participants — chosen for their academic merit and leadership potential — with the opportunity to study, teach and conduct research; exchange ideas; and contribute to finding solutions to shared international concerns. In the past 69 years, more than 50,000 students from the United States have benefited from the Fulbright experience. CUSE provides undergraduate students in all the University’s colleges opportunities for research, scholarship and creative projects. More information on CUSE is available at cuse.nd.edu. Originally published by Michael O. Garvey at news.nd.edu on February 12, 2015.